Quiero compartir una entrevista (en inglés) publicada por el James Robinson Photography Blog. Además de información general sobre fotografía el blog de James Robinson contiene mas de 150 entrevistas realizadas a un gran numero de fotógrafos de estilos muy diferentes que van desde artistas de moda hasta surrealistas. Es un sitio muy interesante para conocer los multiples puntos de vista de fotógrafos de todo el mundo. Para entrar al blog de James Robinson pincha aquí. 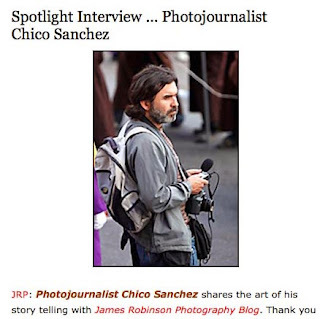 JRP: Photojournalist Chico Sanchez shares the art of his story telling with James Robinson Photography Blog. Thank you Chico for spending this time with us. Chico Sanchez: Hello James, thanks for this interview. JRP: Where do you call home Chico? Chico Sanchez: I was born in Cadiz, Spain. As an adult I have lived in England, Venezuela, and Mexico, but I call home where I am at the time. JRP: When and how did you get started in photography? Do you have any formal training or assisting in your background? Chico Sanchez: I started as an amateur photographer during a three-month-long trip to Texas. I was a musician at the time and had no idea I was about to become a photographer. Six months later I was working my first professional job as a freelancer for Reuters in Caracas, Venezuela, covering protests, coups, and oil strikes. I never attended any academic courses. My first teacher was my current wife Leslie Mazoch. She was working as a photographer at a Texas newspaper. Since then, I’ve learned from all the photographers I’ve met and worked with. When we moved to Mexico in 2007, I began learning about licensing and selling my work through stock photo agencies like the Aurora Photos (USA), Alamy (United Kingdom), and Spain’s Age Fotostock. JRP: Name several photographers that have inspired and influenced your work. Chico Sanchez: Leslie Mazoch, Kimberly White, Ivan Gonzalez, Jorge Silva, Juan Barreto, Esteban Felix and Carlos Diez Polanco but of course I’m sure I’m forgetting someone. JRP: Do you use personal projects to develop and refine your vision and technique? Chico Sanchez: As an independent photographer all of my projects are personal, and yes, when I decide to do a project, my goal is to learn and to improve. JRP: Given the nature of what you do are there people who assist you with your projects and if so what roles do they play? Chico Sanchez: I work alone but I do ask for advice from editors and other photographers. I also consider observations made by non-photographers. My wife, a photographer who is also a photo editor at the AP’s Latin America regional hub, is an important influence on my work. I usually show her my audio-slide shows once they’re finished, and she always has useful advice. Chico Sanchez: A Canon camera, three lenses (70-200mm 2.8, macro 50mm 2.5, 24mmm 1.4) and a small Marantz audio recorder. JRP: Lighting … what are your most often used light modifiers? Chico Sanchez: All of my audio-slide shows with the exception of one use natural light. I love to use the light I find on location. JRP: Please describe your digital and audio work flow and the software you use? 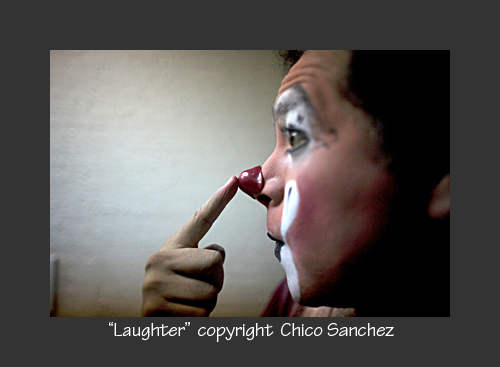 Chico Sanchez: I select, organize and caption pictures with Photo Mechanic, and tone in Photoshop. I edit the audio in Audacity and combine the audio and pictures using Soundslides. My future projects will be using Final Cut. Even if they have no video some of my projects will be exhibited at several museums, so I need to increase their quality for large screens. JRP: There are several of your projects I would like you to comment on. First, “Mother Ines”. What was the inspiration for this project and how did you gain the trust and cooperation of the parties involved? 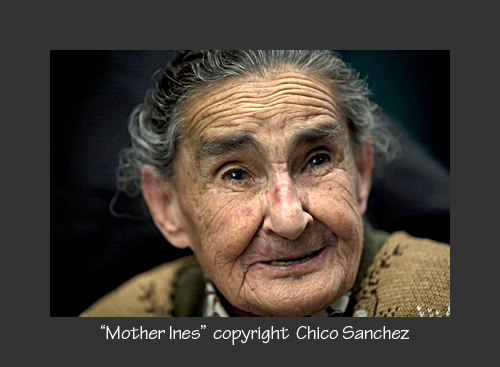 Chico Sanchez: Meeting a person like Mother Ines, who has lived her life helping thousands of children who were abandoned by their parents, and marginalized by society for their disabilities, was a very inspirational moment. I was touched by her dedication to others. I’m honest with the people involved in the story I want to tell. I show them my past work so they can get an idea of what I do, and try to explain the focus of their story that I would like to try to capture. I think one gains the trust and cooperation of others by being honest and respecting them. JRP: Next, the “Boxing” story. What did you do to overcome any lighting and sound issues on location? Chico Sanchez: There usually are no light or sound obstacles because there is always something I can work with, visually or audio wise, and I can always go back for more until I have enough. I’d say that the audio interviews are the most important and challenging part of the audio-slide show to get right, because I cannot control what people say, or how they say it. I have to be persistent and interview many people until I know I have the right soundbites. The “right” interview is spoken in an honest, unscripted voice. Some people get nervous when you put a mic up to their mouth, but some people don’t, and those are the people who offer great interviews. JRP: “The Laughter Fair” project draws upon what personal experiences in the creation of this piece? 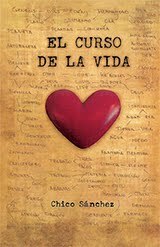 Chico Sanchez: I do stories about everyday lives because they are great stories. Most of the news media shows us unusual angles of things that ignore everyday life because there is nothing “new.” However, just because it isn’t “new” doesn’t mean it’s not interesting. Personally, I was amazed to discover that behind the stereotype I had of clowns, which came mostly from TV, most of them are great human beings who want to help others by making them laugh. JRP: Is there a shoot or project that opened your eyes to the distance you’ve come as an artist? Chico Sanchez: Every new project is a challenge and a lesson, so we grow with every project. 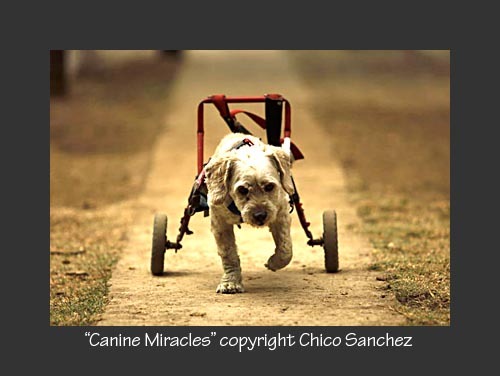 If I had to choose one, the “Canine Miracles” project is the story where I reached a point where I realized that touching people with this story was the goal, and in fact, I understand that quite a few people donated money to the shelter after seeing the story. 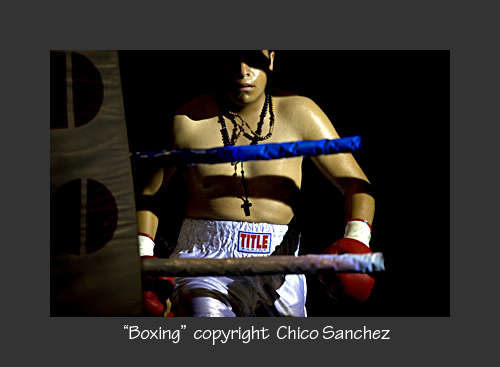 JRP: If not photography what would Chico Sanchez be doing with his time? 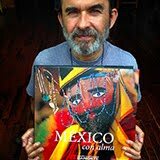 Chico Sanchez: Twelve years ago I was a musician and the last thing I imagined then was becoming a photographer. So honestly, I really don’t know. Chico Sanchez: On my first assignment with Reuters in Caracas, I met Argentine photographer Oscar Sabetta. He told me: “If you focus your energy on success or winning photography awards, you won’t have time to make good pictures. Go to places and get involved in the story with an open mind. If you focus on the story instead of the results of your work, you will be successful. JRP: What advice would you like to share with photographers? Chico Sanchez: Being a photographer should not be a goal, photography is a path. You don’t need the title of “photographer” from a company to be a photographer. Finally, learning to take pictures and tell stories is a never-ending lesson. JRP: Thank you Chico for sharing time with us. It has been a pleasure talking with you, and we wish you continued success. Chico Sanchez: Thanks again for the interview.